Himalayan Salt is considered to be the most pure form of salt on the planet. This is due to the fact it is mined from deep inside the Himalayan mountains where it has avoided exposure to industrial toxins and impurities for thousands of years. There are many health benefits to this wonderful salt, largely due to the vast array of minerals and trace minerals it contains that can help to heal and protect our bodies down to a cellular level. Over the last few years the popularity of this, once hard to acquire salt has soared with various new uses appearing each year. 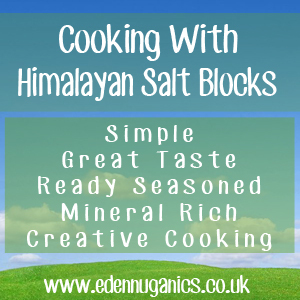 One of the most recent and fun has to be the use of Himalayan salt blocks for cooking! What Are Salt Blocks and How Do I Cook On Them? Himalayan salt blocks offer a great alternative to traditional metal frying pans and are surprisingly simple and efficient to use. Not only can you cook a vast array of foods using these simple, mineral rich blocks, but they leave the produce ready seasoned and tasting simply amazing. To cook on your salt block, it will first need to be heated, this can be achieved in a number of ways. The most common method is to place the salt block directly over a gas hob where it will need to be left on a medium heat for around 30 minutes before cooking. This allows time for the block to gather heat. Himalayan pink salt blocks have the capacity to hold any given temperature you bring them up to for around one hour meaning they do not need to stay above a heat source whilst cooking. Selecting Your Block - When cooking, it's important to only use salt blocks that are at least 1.5 inches thick. Thinner blocks can be prone to cracking under high temperatures. Thicker blocks also store heat more efficiently. Cooking On Your Block - Every type of food reacts differently on your salt block. The effect of the salt on the food will depend on a variety of factors. Foods that cook quickly usually work best, so make sure pieces are cut to an appropriate thickness and that the block is hot enough. Cooking on a salt block that hasn't been heated to a high enough temperature will not only make your food too salty, but it may also degrade your block. When the block is at optimal temperature (under the grill is best), then take it off the heat and start to cook on it. A popular use is to put it on a heat proof tile in the middle of the dinner table and wow your friends and family by sauteing fish, meats, and veggies while your guests look on in awe! The outdoor variation. Heat your block on a gas stove indoors (use extreme caution) or outside on a BBQ and then cook on it in the centre of the table or as you like. Place a larger platter of the Himalayan salt on the rack of your oven, preheat, and then bake bread, pizza, and savoury pastries. Another curious use for the salt block is using it cold! You can put it in the freezer for 2 hours, then take it out and present ice-creams or sorbets or whatever you want on it! Moist foods take on a hint of salt from the block (dry foods do not) and as is in vogue at the moment, sweet foods with a hint of salt is very interesting for the palate. If you drop your salt block and it breaks, you can break it up even further and use it in a bath as therapeutic bath salt, and pumice stone. Some of the most popular foods cooked on salt blocks include; salmon, steak, peppers, onion and shellfish. However, most things can be cooked on these versatile blocks. Cleaning - Before attempting to clean your salt block be sure it has cooled completely. Next, moisten with a damp sponge (do not use soap). Once the whole block is wet, scrub with a soft brush or green scouring pad to remove any stuck matter, and then wipe clean with the sponge. The block actually has natural antifungal and antibacterial properties. If you store it indoors, away from moisture and heat it can last for years.